The BBC obligingly reports on a Canadian government analysis of the national warming trend which concludes that warming since 1948 is twice the global average and is mostly due to greenhouse gases expelled by industries and homes. Which is convenient, because Turdeau is currently expanding the regressive socialist carbon tax to include another four provinces. Canada’s annual average temperature has warmed by an estimated 1.7C (3F) since 1948, when nationwide temperatures were first recorded. Globally, 2014 and 2015 were the two warmest years on record. At odds with these global records, eastern Canada experienced pronounced annual cold anomalies in both 2014 and 2015, especially during the 2013/14 and 2014/15 winters. This study sought to contextualize these cold winters within a larger climate context in Toronto, Ontario, Canada. Toronto winter temperatures (maximum Tmax, minimum Tmin, and mean Tmean) for the 2013/14 and 2014/15 seasons were ranked among all winters for three periods: 1840/41–2015 (175 winters), 1955/56–2015 (60 winters), and 1985/86–2015 (30 winters), and the average warming trend for each temperature metric during these three periods was analyzed using the Mann–Kendall test and Thiel–Sen slope estimation. Overall, Toronto winter temperatures have warmed considerably since winter 1840/41. The Mann–Kendall analysis showed statistically significant monotonic trends in winter Tmax, Tmin, and Tmean over the last 175 and 60 years. These trends notwithstanding, there has been no clear signal in Toronto winter temperature since 1985/86. Within the past 30 years, the significant warming trends in Toronto winter temperature appear to have broken down. While this could simply be the case of a signal being lost in the noise of an increasingly varied seasonal weather series, it is possible that some external driver is influencing Toronto winter temperatures. This study examined some of the myriad factors that influence Toronto winter temperatures, including the urban heat island affect, major global circulation pattern teleconnections, and the polar jet stream. For the Canadian Arctic, the available meteorological seriesof data are particularly short and most cover only the period after World War II. The results showed that air temperatures in the Canadian Arctic from 1819 to 1859 were not as exceptionally cold as has been suggested by some analyses of proxy data (Koerner, 1977; Overpecket al., 1997). This conclusion is confirmed by the fact that the majority of the mean monthly air temperatures lie within one standard deviation (SD) from the modern mean (Figure 2), and only in a few cases do they exceed the level of two SDs. Both kinds of data (monthly and daily) clearly show that the Canadian Arctic in the nineteenth century(1819 – 1859) was colder than today, but the average annual temperature during this period was only about 0.7°C lower in comparison with the present-day (1961 – 1990) value. It was also shown that in the period from 1819 to 1832, the annual temperatures were warmer than in the 1850s by about 0.3°C. In the annual course, the greatest differences between the mentioned time periods occurred in winter and spring. During the first period, significantly warmer winter and colder springs were noted. Throughout the whole study period, the majority of mean monthly and daily temperatures lie within one SD from the modern mean. (2) The most typical features in the annual courses of air temperature in the study period were very cold winter months (December to February, 1.5 – 2.5°C below today’s norm) and warm springs and early summers (April to June, 0.3 – 2.7°C above today’s norm). What these studies do is confirm that reliable instrumental data, especially in Northern Canada, is only available after WWII, so the observed warming trend from 1948 – attributed almost entirely to GHGs – may or may not be exceptional in terms of the long term variability of climate in Canada. They confirm that in Toronto at least, the urban heat island effect, natural variability and changes in circulation patterns (the jet stream) may have been very significant contributors to observed trends and that no significant warming of winter temperatures occurred during the period 1985-2015 – when CO2 was increasing fastest. They confirm that mean annual temperature trends in Canada are heavily influenced by seasonal variability, which suggests natural influences more than GHG global warming. They confirm that the 19th century wasn’t quite as cold as some suggest and indeed that in the early 19th century, it was significantly warmer than in the mid-19th century. Turdeau can’t blame carbon emissions for that – well, he could, I suppose. You don’t need common sense, science and observations when you’ve got regressive socialism. Ask AOC. Tags: Arctic, Canada, carbon tax, climate change, global warming. Bookmark the permalink. Previous post ← Daily Mail: Britain Will Get Hotter and Wetter and Plagued By Killer Zika Carrying Mosquitoes as Global Temperature Rises 8.5C by 2100 in ‘Business as Usual’ Scenario! “Canada feels the measurable impact of climate change, and global warming, more than most other countries. Scientists from coast to coast, including our own federal government’s experts at Environment Canada have stated this publicly. EC’s senior climatologist told CBC that if you look at the last seven decades, the effect on temperatures has been at least twice as noticeable in Canada as the rest of the world. This is the first time I’ve seen socialist policies called regressive. I think you have that correct. I’ve always wondered why they’ve been referred to as progressive! Though temperatures over Canada no doubt have risen over the past century, there has not been any real warming in over 25 years. Rather, there’s been slight cooling, though not statistically significant. Clearly there hasn’t been any Canadian warming recently. Thanks for the links Dennis and Ron, which confirm the fact that, in Canada as a whole, there has been no net warming for the past 3 decades and that the warming which has taken place since the mid 19th century is not unusual in the light of past natural variation. 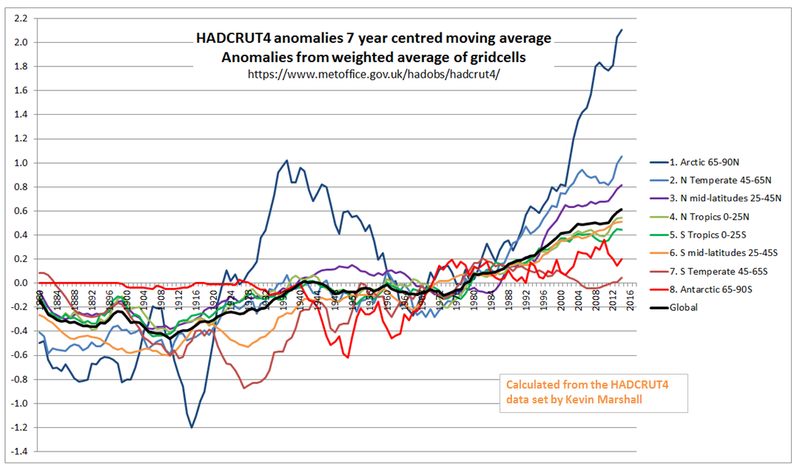 As usual though, the climate alarmist propaganda machine gets hold of a truncated set of instrumental data and makes it jump through hoops to ‘prove’ that we are drastically altering the climate. How to spread fear and despondency amongst Canucks – tell them their winters are getting warmer. Next step tentatively suggest, by unattributed innuendo, that their national winter sport of outside or schoolyard ice hockey will be threatened. I lived ten years on the Prairies (Regina* and Calgary) and I can attest to the fact that, if any part of the world might benefit from winter warming at twice the world average temperature rise, it is that frigid hell. However, starting from such a low base, who would notice? *The worst I ever experienced was a day in Regina in the 1970s when temperatures dropped below -40oC and, unusually for such cold conditions, the wind blew strongly, creating horrendous wind chill conditions. Rotating fan belts on cars froze and snapped leaving stranded cars and drivers all over the city. The actual report quotes a regional warming attribution study to justify its main conclusion that most warming from 1948 is anthropogenic in origin. It’s the usual con-trick. Estimate anthropogenic influence on temperatures using a selection of models from the CMIP5 ensemble (mean ECS = 3,2C. i.e. high climate sensitivity) which also systematically underestimate natural internal variability. 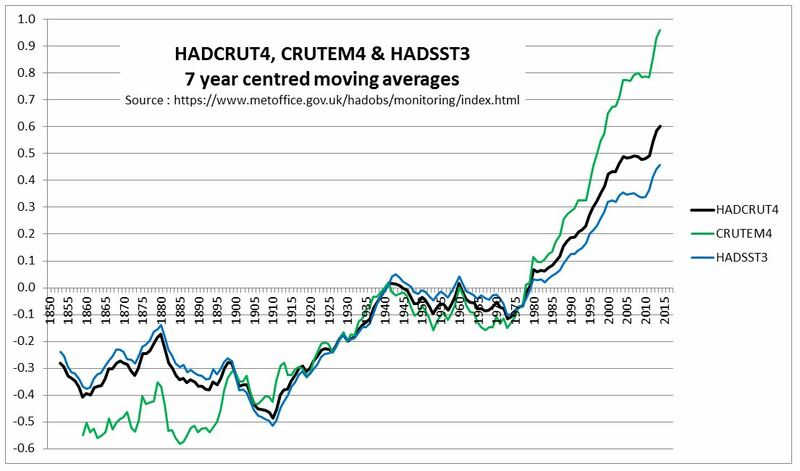 Cherry-pick a convenient truncated period of strong warming where instrumental data is richest, weighted strongly against past historical and very patchy instrumental data and proxy data. Regional effects of see – oh – too? Thought it caused GLOBAL Warming – my bad! Slightly more than zero times 2 then. This makes me think of the early days of Catholicism, when it was becoming the state religion. You’d probably hear it more in the US where some of the loony left call for actual racial segregation and frown upon interracial dating etc in the media, while the rest either pretend not to notice or nod at the sagacious wisdom. Above I commented and posted on the dangers of PC-enforced monotonic diversity (“It’s OK if you don’t look like us, as long as you think like us.”). I must now reference a much more encouraging report of the state of these affairs at my alma mater, Stanford, one of the earliest schools to stopping teaching Western Civ, and the cradle of global warming/climate change alarmism. Journalist Richard Bernstein’s 1994 book, Dictatorship of Virtue, was among the first on the rise of political correctness. Twenty-five years later, he returns to Stanford University to take stock of the forces unleashed — and those kept in check. “In the decades since, there’s been plenty of righteous indignation expressed: the campus thought police demanding (and often getting) protection from anything they deem to be offensive; informal limits on free speech; reckless accusations of racism, sexism, and homophobia; violent demonstrations against conservative speakers. It goes on. That doesn’t sound more encouraging, Ron! My reading of that excerpt you provide is that it is tragic. The parasites of the left have won completely. They have stolen our Western heritage and replaced it with shallow classes on secular dogma. All the schools seem good for is indictrinating more parasites and training technocrats. What is becoming very clear is that the climate change community has it backwards. It is not that democratic societies are not up to solving “climate change”. It is rather that the climate change community has failed democratic society. They are incapable of honestly or openly communicating their concerns. They are only capable of demanding that everyone do as the ccc says or else. Dialog, tolerance, reason, compromise: the ccc rejects all of these and other fundamentals of civil society. On that alone the ccc is worth rejecting. This Canadian bit of fear mongering is just the latest example. There are two basic reasons that Canada has warmed by twice the global average since 1948. Second is that Canada is in the North of the Northern Hemisphere. Last year I split the HADCRUT4 data into 8 bands of latitude. The Western and Central border with the USA is at 49N. The Southern Border of the Yukon, North West and Nanavut Territories is at 60N. The most southerly major city is Toronto at 44N. Therefore, much of Canada had early twentieth century warming, then mid-century cooling, then warming of a similar magnitude to the early twentieth century. The Canadian Report confirms the global trend in section 4.2.1.1 on page 125.
where average temperature increased by less than 1ºC in some maritime areas. That is, the biggest rises in average temperatures were in or near the Arctic. Southeast of Canada, by the coast, warming was near the global average.